Brad’s Aoudad Sheep Hunting Trip, His Distinctive Laugh & Miles of Duct Tape!! As I loaded my truck I was excited to be heading back out to West Texas to hunt aoudad, but I was even more excited because of who I would be hunting with. Racing bicycles you spend hours and hours training and riding and over those many hours I had the pleasure of getting to know Brad. Over the years we spent a lot of time together on the bike as well as off the bike traveling to races and hanging out, but this would be the first time we ever hunted together. Plus the ranch we would be hunting was right on the course of one of our most favorite races. I couldn’t wait!! Early Thursday morning I was pulling into Brad’s driveway and we were quickly loaded and heading West. Traveling with Brad was always a blast! His stories and distinctive laugh helped pass the time and in a few short hours we were pulling up at the ranch. After unpacking and getting settled in at camp, we headed out in the dune buggy. We covered quite a bit of country, but the aoudad were hiding pretty well so we decided to head back to camp. Tomorrow morning was going to come in a hurry, plus ribeye’s and asparagus were calling our names! 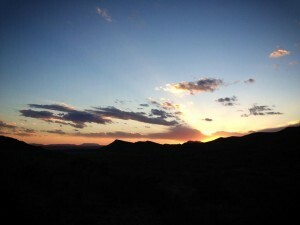 As soon as the sun broke the horizon we were in the dune buggy in search of aoudad. It was late October, and Fall was starting to settle into West Texas, and with temperatures in the low 40’s we were all bundled up as we headed out. Heading North out of camp we got on the paved highway dividing the Northern and Southern portions of the ranch and as the speed increased we were all happy to be bundled up. Turning off the paved road we started to climb into the mountains in the northern pasture of the ranch. Bouncing along the rough mountain road we climbed higher and higher into the mountains and finally crested out on a saddle overlooking the valley we had just climbed around. We got out of the dune buggy to glass the mountains and valley below, but not spotting any aoudad we climbed back into the dune buggy and continued bouncing our way to the top of the mountain. Topping out along the northern most fence line we got to a nice vantage point and stopped to glass the mountains and valleys below. We had been glassing for about 10 minutes, with no luck, so I started glassing the mountains on the south side of the highway. As soon as I started glassing the mountains across the road I found them! It was one of the biggest herds of aoudad I had ever seen. It looked like the whole mountain was moving. There had to be 100 aoudad in this herd and despite being over a mile away I saw a huge aoudad ram (check out this video of a similarly huge aoudad herd that I filmed a bit later). The aoudad were moving off the top of the mountain and it wouldn’t be long before they dropped down low enough that we would loose sight of them, so we had to go! It took us about 15 minutes to get off the mountain and across the highway but once we got across the highway we couldn’t see the herd of aoudad so we drove as close as we thought we could get away with and parked the dune buggy. Since we were still bundled up from riding in the dune buggy it took us a little while before we were ready to begin the hike up to where we thought the aoudad had gone. The slight breeze in our face helped cover our scent as we began the hike up the mountain closest to us. Not knowing where the aoudad herd had gone we took it slow and steady stopping every 20-30 yards to glass and listen. Most people don’t know aoudad vocalize, but once you’ve been close to them and heard them you know they vocalize quite a bit and it’s such a distinct noise that you only need to hear it once and you won’t ever forget it. As we approached the top of the mountain we were hiking up, we looked across the valley and there was the whole herd! There had been quite a bit of rain out in West Texas in recent weeks and there was a natural pool of water where the herd was headed to water. We were inside of 400 yards to the whole herd, but the biggest aoudad in the herd had too many aoudad around him for a clear shot. We had good cover in the big rocks where we were hiding and the wind was in our face, so we decided to wait for a better shot. As we patiently waited in the rocks, aoudad kids hopped from rock to rock and splashed in the natural water hole. The rut was in full swing and aoudad ewes were being nosed around by other rams in the herd, but whenever the other rams would get out of hand the big aoudad ram we were after would chase them off, but he never present us a good shot. We watched the herd for about 20 minutes and we got to see and hear things that I’ve never seen or heard since. After all of the herd had watered they started to slowly move off and feed. There were aoudad feeding toward us as well as across the valley heading up an adjacent mountain. We still had the wind in our favor, but aoudad were getting close and we needed to do something quickly or we were going to have aoudad walking right on top of us! They were so close we could hear their hooves walking on the rocks as well as smell them. As distinct as the noises that they make are, their smell is the same. As the herd began to move off from the water hole the big ram slowly followed feeding in our direction. 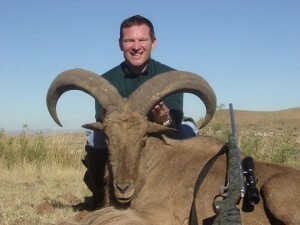 We had aoudad as close as 60 yards, but the big ram still hadn’t turned broadside enough for a shot. The closer they got, the more I noticed Brad’s breathing. He had been very calm…until it was time to make the shot. Now his heart rate was racing and his breathing was getting so loud I thought the aoudad were going to hear him. Finally the big aoudad ram turned broadside just enough for Brad to get a nice broadside shot, he squeezed the trigger, and the huge ram fell in his tracks! After taking pictures we had to figure out how to get the aoudad off the mountain. We were debating between caping him in the field and trying to get the dune buggy up to him and take him to the barn and hang him up to cape him. We decided to try and get the dune buggy up to him and after a little fancy driving we made it right up to the big aoudad. We got him loaded on the dune buggy, headed back to the barn, and got him caped and in the walk in cooler. It wasn’t even noon and we already had a huge aoudad ram hanging in the cooler! That afternoon we had an early dinner and headed out in the dune buggy just to mess around and enjoy the beauty of West Texas. We weren’t even a mile from camp when we came upon a herd of about 50 aoudad out in the flats between mountains and the chase was on. We already had Brad’s aoudad, but it’s not very often you catch aoudad out in the flats so we were going to have a little fun. Once the aoudad made it back to the mountains we continued our cruise around the ranch. That afternoon we saw blue quail, javelina, pronghorn (this was prior to the death of the majority of the pronghorn in the Marfa, TX area), dove and coyotes. As the sun began to get low in the horizon we found a nice vantage point to watch the sunset, West Texas sunsets are some of the most beautiful you will ever see, and sat there and relived the days hunt and told stories and just enjoyed each others company. The next morning we loaded up and headed back to San Antonio. Brad’s aoudad had been in the cooler almost 24 hours and was cold enough to make the trip back to San Antonio just sitting in an ice chest, but that wasn’t good enough for Brad. We had to stop in Ft. Davis and buy about 20 bags of ice and about 4 rolls of duct tape. After putting the aoudad head in the ice chest we proceeded to pack ice around it like we were driving across the country. Then we took the duct tape and wrapped it up like we were trying to keep anyone from ever getting into it. It was way overkill, but anyone that knows Brad knows that that’s just how he rolls. The drive back was just as fun as the drive out. More stories were shared and lots of laughs had on the way home plus every time I looked in the rear view mirror I saw the tip of a huge aoudad horn sticking out between the miles of duct tape! 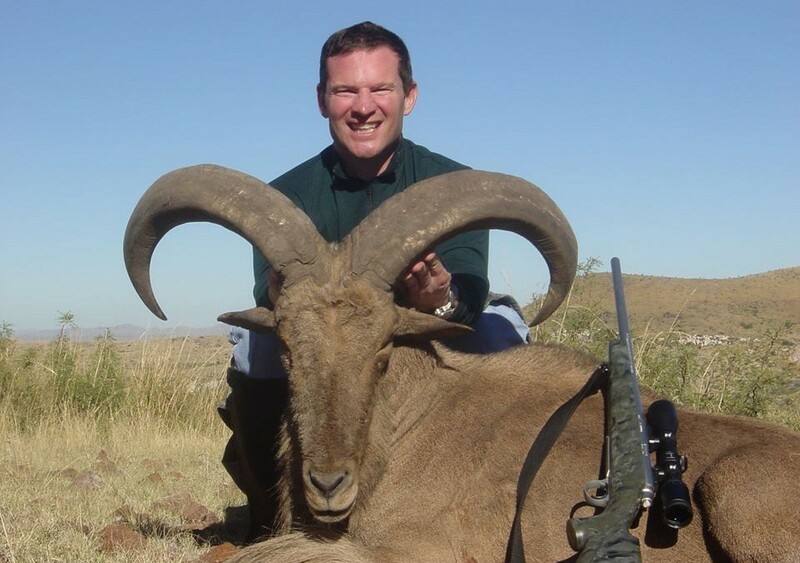 With almost 14″ bases and 31-3/4″ horns, Brad’s aoudad is one of the biggest ever harvested with Double Diamond Outfitters. Unfortunately, on May 24, 2013 this world lost one of the most kind, caring, generous, loving, wonderful men to ever walk the face of this earth. I feel very blessed to be able to call Brad Limmer my friend and to have had him in my life. This world just won’t be the same without you and I miss you more than I’ll ever be able to express. You touched my life in ways I never thought possible.